Color Club Berry Bright is scented. And it stinks! Like seriously stinks. So bad I am taking this off right away. Just the movement of my hands makes the smell unbearable. Oh my heck what were they thinking. It's such a pretty shimmery berry red color too. I really like the color. I thought for sure TC was going to hide it. And when it didn't I thought there was no way it would survive SV. It did. It's from the 2012 Winter Affair Collection. China Glaze Glistening Snow is perfection. 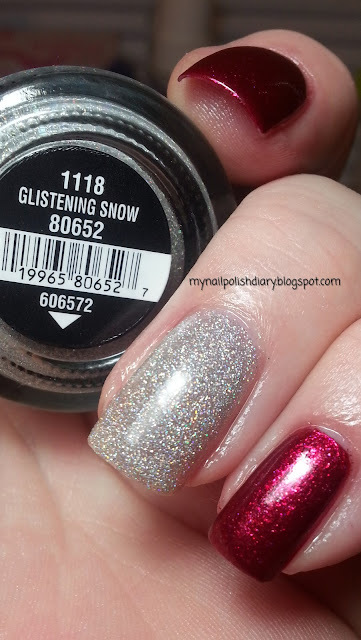 Released in their 2012 Holiday Joy Collection it has micro holo silvery glitter. I love it. I don't know that I could do an entire mani with it though. It's intense. Kicking myself that I did not pick up Glistening Snow..I thought initially nope - have something like it - but I don't..not in this great coverage formula of microglitter. I got last 2011 Ulta exclusives from ChG in 2 shades (tracked 'em down after holiday)..and I picked up this yrs. ChG Holly whatever it's called in that great shade of forest green microglitter (knew I had nothing like it)...I have seen so many swatches of Glistening Snow and nothing but great reviews on it. I don't seem to ever smell any of the scented polishes that I have picked up this and last yr from Color Club. I did not pick up this one red because I have others that look like it - but I did get the scented purple one and have last yrs red that was supposed to be cinnamon. Maybe my smeller is immune. Have a happy! Oh, I do hope you can find Glistening Snow. It's a must have for sure. As for scented nail polish, BLEH! I have yet to meet one I like. I have one on right now, and it's also terrible. The good news with this one though is that it faded with TC and by the next day (today) there is almost no smell at all. Not enough to be annoying anyway. Thanks for looking beachgal!